Ms. Guttilla has nineteen years of field experience working in central California and the California Channel Islands. 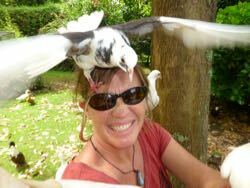 She has extensive experience in endangered species management and working with species of conservation concern (island fox, island spotted skunk, California condor). Darcee’s graduate studies on feral cat ecology on Catalina Island provided her with in-depth experience in managing controversial issues, education outreach, and bringing stakeholders together to effectively address challenges. Her breadth of field skills include the following: live-trapping and handling mammals (small mammals, island fox, spotted skunk, feral cats), radio telemetry, track plates, remote cameras, spotlight surveys, identification of California birds by sight and sound, nest surveys, pitfall trap arrays, amphibian surveys (California red-legged frog, California tiger salamander), monitoring for nonnative/invasive species (rats, feral cats, and bullfrogs), chemical/mechanical control of noxious weeds, vegetation identification and mapping, native plant propagation, and habitat restoration (scrub oak woodland and riparian habitats). Darcee also participates in the annual USGS North American Breeding Bird Survey in Santa Barbara County. Before coming to CCCI, Ms. Guttilla conducted biological compliance monitoring and mitigation for a federal military munitions response program for the following species: El Segundo blue butterfly, California red-legged frog, vernal pool fairy shrimp, western snowy plover, California least tern, Gaviota tarplant, dune thistle, beach layia, and Gambel’s watercress. She also provided expertise on California tiger salamander and California burrowing owl.